Wind hole East-West & North-South centers..
No. of steps in stair case should be odd numbers. Head in South while cot arranged, 2nd preference East. South-East or East face cooking range. EWC facing North or South. Septic tank North-West or South-West. 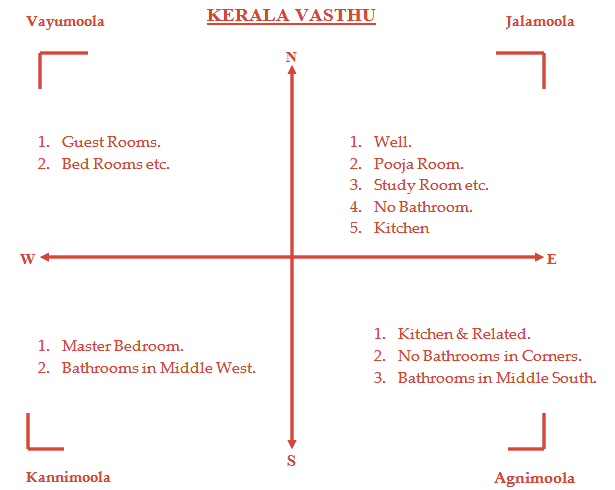 While placing a villa in a plot South space & West space should be less than others. Loft extra South & West. Back Openings, 1.North/East – Northeast 2.South – South-East. 3.West – North-West. While putting pillars it should be 2 or its multiple (Even). Permitted measurements in feets for preparing rooms, 4” , 6”, 8”, 10”, 11”, 16”, 17”, 20”, 21”, 22”, 26”, 27”, 28”, 29”, 30”, 31”, 32”, 33”, 35”, 36”, 37”, 39”, 41”.